The almost unbelievable story of Denis Avey, now 92, began in 1944 when he was captured and sent to a POW work camp. He was put to work every day in a German factory, where he labored alongside Jewish prisoners from a nearby camp called Auschwitz. The stories they told him were horrifying. Eventually Avey's curiosity, kind-heartedness, derring-do, and perhaps foolhardiness drove him to suggest--and remarkably manage--switching places with two of the Jewish prisoners in order to spend a couple of harrowing days and nights inside. Miraculously, he lived to tell about it. Review: Reading this book is like listening to your grandpa tell you stories about his youth. I really enjoyed Avey's experience in Africa as well as how he and his fellow POW's attempted to sabotage the Nazi's war effort in the work camp. Avey had an impressive mental toughness that allowed him to survive. I think one of his biggest acts of bravery was helping a Jewish soldier by securing cigarettes for him. It turns out those cigarettes saved that man's life by allowing him to buy new boots and survive the death march. 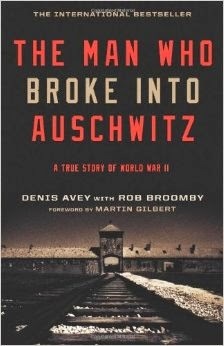 The weakest part of the book is how he supposedly 'broke into Auschwitz.' I realize publishers try to come up with snazzy titles to generate sales but this was really misleading. Avey claims to have swapped places with a Jewish prisoner (Hans) for 2 separate nights so he could bear witness with his own eyes and confirm what was going on (this was maybe 3 or 4 pages in the entire book). Now-I say 'supposedly' and 'claim' because it didn't seem believable that any of this happened (several researchers and experts on WWII also dispute his claims). Assuming he did swap places with Hans, his reasons were extremely weak (he could already see what going on) and he put Hans as well as everyone in Hans' block at risk. I'm not sure how someone could mistake him for a prisoner (the POW's were fed much better than the Auschwitz prisoners) and one of the prisoners should (would have?) turned him in for a favor. After the war was over, it was very sad to learn about his PTSD but inspirational to learn how he was reunited with Ernst's (the man he helped save with the cigarettes) family.